The 2011 NFL player draft won’t end until Saturday, but a Hilliard company already has a more-than-educated guess about whether Bengals pick A.J. Green or the Browns’ Phil Taylor will boom or busts as pros. Achievement Metrics LLC breaks down tape, but it’s minding the P’s and Q’s of player prospects, not the X’s and O’s of how they run, catch or throw a block. The company predicts risk, and it doesn’t look at game film, rather it analyzes press conferences. “Words correlate to characteristics, which correlate to outcomes,” CEO Roger Hall said. How an individual speaks, he said, is a gauge as to how they think, and the company thinks NFL franchises could find that valuable when they analyze how to spend millions of dollars on player contracts. 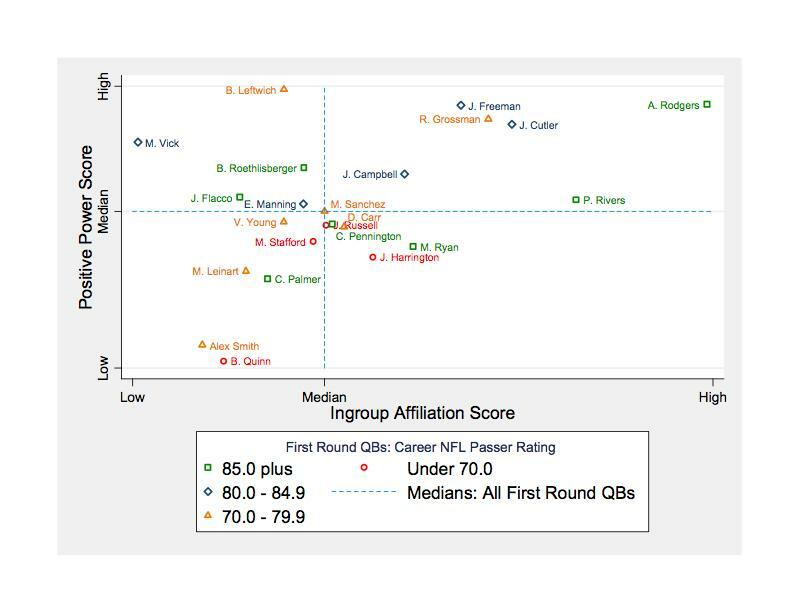 The career passer ratings of several NFL quarterbacks show how their performance has matched up against Achievement Metrics' assessment of their speech while the players were in college. The chart places the players according to their scores for "positive power,” or their belief in the ability to influence outcomes, and “in-group affiliation,” or how well they interact with a group. The firm cautions that the report "is designed for informational purposes only" and "should not be construed to guarantee a player’s future performance or behavior and is not a comprehensive statement, evaluation, or judgment of any player’s character or future performance." Online magazine Slate.com has a more detailed breakdown of the science, but Hall said the brief pitch is this – it creates psychological profiles of player prospects based on words used in spontaneous speech. It isn’t a grammar test. An algorithm analyzes speech to determine traits such as “conceptual complexity,” or whether a prospect views the world in shades of gray or clearly pall mall cigarettes delineates it in black and white; “positive power,” or belief in the ability to influence outcomes; and “in-group affiliation,” or how a prospect associates – well or poorly – with a group. The company is a sister business to Social Science Automation Inc., which has been conducting text analysis for the government since 1997. It began looking for non-government applications in 2006 and created Achievement Metrics, which also is working to apply the science to entertainment, CEO evaluations and other areas. The initial football efforts were spent looking at whether prospects would be off-the-field risks, but Hall said executives saw connections to on-field performance as well. The firm has compiled research on more than 750 current and former players and how newport cigarettes what is uncovered in their speech relates to performance measures, such as Pro Bowl selections, quarterback ratings and rushing and receiving yards. But any football fan that glimpses the chart would likely agree it separates the studs from the duds. The firm is working to win over football decision-makers. It hasn’t been easy. “The way a prospect talks in college translates to how they play in the pros? You gotta be kidding me,” Hall said of the early reception to the science. He said Achievement Metrics has done demonstrations for several teams and had meaningful discussions with many teams in the league. Maybe the proof will be in this year’s crop of data? Achievement Metrics isn’t releasing its 2011 findings yet because some of the players analyzed have not yet been drafted.